Asics Trading Company is yet another Japanese net-net stock. The company trades on the Tokyo exchange and is a shoe manufacturer. The company makes what appear to be dress and casual shoes (as seen by an American with little fashion sense). I should also note I have no idea what the Japanese wear, these could be the most hideous shoes in the world to someone from Japan and I would never know. The shoes I looked at online all had what I would consider reasonable prices. One of Asics Trading's online shoe sites can be viewed here. Like most stocks I write about on this blog Asics Trading shares are trading below their net current asset value. In addition the company is profitable and has decent free cash flow. I've taken a bit different approach with this post, I'm using the Peter Cundill inspired net-net template as the basis for my valuation work. At the end of the post I am linking to the Google doc version of this template for online viewing or modification/download. As always the first thing I always want to consider with a net-net is the strength of the balance sheet. In the case of Asics Trading 75% of its market cap is composed of cash, the rest receivables and inventory. The company is in retail which means that it's important to take a look at the trend of receivables and inventory. Over the past five years inventory has remained stable and receivables has come down slightly. The company has no long term or short term debt and no pension costs. 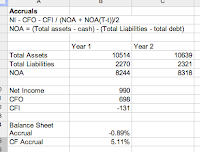 The below picture is a snapshot of the balance sheet portion of the net-net worksheet. So the result is balance sheet accruals aren't a big issue but we need to watch out for income statement accrual issues. My rule is that I avoid net-net investments where the operating business is destroying my margin of safety, to evaluate that I take a look at the income and cash flow statements. What I like is that cash flow and free cash flow have been consistently positive the past five years which includes the recession period. One of my fears for this stock is that if Japan hits another downturn shoe demand could shrink further hurting the company, but looking at the past that doesn't seem to be the case. The company also has a history of recent higher profitability which is good. When investing in a net-net I try to avoid companies where the earnings are at an all time high, I prefer to see fallen heros verses growing champions. A fallen hero has experienced profits and success and has hit a bad patch, it's often easier to fix what went wrong than create an environment to nurture future growth. The ROIC for Asics Trading comes out to 7.39% which is good for a Japanese company. The caveat I have is that there might not be many growth opportunities available for Asics Trading. With a ROIC of 7.39% it would be wise to invest in new business opportunities, instead they are piling cash on their balance sheet and capex has remained stable. The lack of cash deployment says to me that growth might not be available. -The company is small it has a market cap of $111m. -While the balance sheet and sales have grown net income dropped off in 2010. -Shoes are not an exciting industry to be in, they are dull boring and not high tech. -A depressed outlook for Japan could result in consumers delaying shoe purchases which could hit Asics Trading's sales. -The company doesn't export as far as I can tell which means they are completely reliant on the Japanese consumer. A 10x multiple on the FCF plus cash results in ¥1609 which is 56% higher than the current price. A sum of the balance sheet results in ¥1736 which is 68% higher than the current price. Taking the NCAV plus a 5x FCF multiple results in ¥1701 which is 65% higher than the current price. Buying Asics Trading for ¥1030 gives no credit to the fixed plant or the operating business which throws off ¥76ps in FCF. -The company's business could deteriorate and begin to impair the margin of safety. -The company's financial statements are all in Japanese. -The company could spend the cash pile on an ill conceived acquisition. -Shoes are a commodity item and Asics Trading is a price taker leaving it vulnerable to larger players in the market. Disclosure: As of the time of this writing I hold no position in Asics Trading Co. I am considering a long position and plan to research further. Love the sheets you put out there. I like your style of writing and the ideas you come up with. Are you particularly interested in Japanese stocks because of the valuations overall or due to the drops in prices after the nuclear disaster? Nice try by the way with the Solitron write up, I think it is a good idea to continuously think about an investment and put it in perspective of the world that constantly changes. I know what you mean with posting at once a big report on a company you're investigating. I'm trying for two weeks now to write a report on $BAMM, I think finally I got to finalize it this week. Do you have any thoughts on BAMM by the way? Thanks for the compliments I'm glad you appreciate the work. What got me interested in Japan is the low valuations, I would prefer to invest in a country that is a bit more shareholder friendly but the prices are so cheap in Japan it can't be ignored. I haven't taken a look at BAMM yet, I'll be interested to see your writeup on them. I know they're a book seller but that's about it. Even in a declining industry like book sales if shares are cheap enough I will always consider them. Asics most definitely do have a presence in Europe. While they wouldn't be as common as Nike or Adidas, you would expect to see them in most shoe stores. I would like to share some info on geographic contribution, as of financial year ended March 2010. It is interesting that profit margins are higher in Europe than Japan.